Can I Just Say Something About Ugly Girls? I don't want to overstate things but I have to state this: I knew Lindsay Hunter was a masterful short story and flash fiction writer. 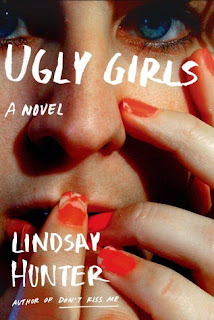 Ugly Girls, her first novel, which was published by FSG last November, proves demonstrably that there might indeed be no limits to the ways in which Hunter can tell a story. No, seriously. This is seriously true. For me, the single most important aspect of anything I read is how immediately I get swept up into it. It took maybe a single chapter before I was lost in the world of Ugly Girls' main characters, Perry and Baby Girl, two exceedingly flawed but no less fascinating young women living (and so searching for fun and purpose) in the deeply impoverished rural south. Reading is always nice after that happens. You look for opportunities to get back to the story, the novel, whatever -- whenever you can. I hate to say it, but for me it's also a fairly rare experience, especially as I get older. It's how I know for sure the book I'm reading is going to be a favorite. It's weird to have this kind of meta-awareness of your reading tendencies and what sorts of feelings you need to feel for something to have just the right level of impact that it stays with you long after you've completed it. It's also hard to articulate precisely why this happens in the first place. And I'd argue this is mainly due to something based in visceral emotions that hit on deeper aspects of what it means to be human. And so I read to chase such feelings, among many other reasons, Cliched and maybe stupid as it is to phrase it like this, reading is my favorite drug, right next to caffeine come primarily in the form of coffee. So, all of this is to say, the trials of the characters in Ugly Girls were effortlessly readable. Two young women who received very little stability from the few adults in their lives seek comfort in their own friendship, a friendship riddled with all its own kinds of dysfunction. They steal cars and shoplift together, leading to their eventual arrest at a Walgreens. They play manipulative games with a dangerous stranger and ultimately, if accidentally, kill someone as a direct result. But you never think of them as entirely to blame for their actions. That's not to remove them from their responsibility, either, just to acknowledge that the world they reside in is not the kind of fertile ground that makes things accessible and leads to an obvious path to a happy future. Its the kind of world of despair and hopelessness where people will look for anything, any sort of stimulus, to feel something. And Baby Girl and Perry's experience is merely the apotheosis of this in all its extremes. Hunter's work keeps maturing, over and over again, with each successive book. Envy her talent and read Ugly Girls.